DATE: 1970 August-roughly-TIME: 3 am-WEATHER: clear, warm, windless, large full moonlight lit, starry night. So, this is what 'THEY' look like up close, and I bet nobody has ever seen them do this! WITNESSES: 16 people...six adults, 10 young people ranging in ages from 49 to 10. SHAPE_OF_OBJECTS: inverted 'pie-pan' metal saucers, which morphed into sparkling white orbs, then back into saucers again. I will skip the details of my brother and my interest in science fiction....which led to us sitting in the front cab of our camper motor home, looking at the stars, as our convoy of relatives made a lengthy rest stop. The night was clear as bell. We were parked by a lone hill, on a rarely used back road, coming into Yuma Arizona. I say rarely used because, the whole hour we were there, no other cars happened past us. We were on the outskirts of the city, parked in the actual dirt road, beneath a tall telephone pole, on the earlier mentioned lone hill. Just a large bump of dirt really, that had missed getting leveled with the rest of the dirt road. I remember the full moon being so bright one could see far into the field across the road from us. I noticed a string of blue lights, lying parallel on the ground, and I thought we might be near an airfield landing strip. The lights were like small dark blue stars, the way a black light bulb looks these days. There were two large oak trees in the vast field of yellow waving dry grass, close to the dirt road, about a 300 ft. away. The grass was not very tall, just like the dead, sun scorched grasses of any given field...about 5 ft. high. I am 5 ft. 7 inches tall, so the grass would be waist high to me, if I were out standing in it. I thought the blue lights were a landing strip, because they were that hot electric blue color, and there were about 18-20 of them, equally spaced apart in the field of dead grass, but there were no buildings, or farms, or anything for miles all around us, and NO AIRPORT! just the two huge oak trees, the twin strips of landing lights on the ground, the endless grass, and the black, diamond twinkling silhouette of the Yuma Arizona city skyline in the far distance. A thought crossed my mind for a quick second. Where was the source of electrical power for these lone lights, and who turns them off, and on in an empty field, in the middle of nowhere? To the right hand side, lay the city's brightly lit black skyline. It had to have been at least 10 miles away, but as the land was generally flat, we had a totally unobstructed view of it. Wondering why planes would want to land in the middle of an empty field, by an oak tree no less, we watched the supposed landing strip to pass the time, hoping to see an approaching plane coming in for a landing.... We looked away for just a moment, to ask for a snack plate through the adjoining camper service window. We hadn't even looked away two minutes, when I noticed, a set of landing lights, one red, two white, and one greenish aqua, coming in low, just over the grass of the field, headed straight towards us! How could I have missed the sound of this approaching flight? I thought it was strange, they were airplane lights, but it was flying way too low, vertical to the horizontal landing light strip, and it was coming in painfully slow...too slow, like it was gliding or crashing? We didn't no which, so we watched it for about 15 minutes. We wound down the window to listen if we could hear a motor in distress or something... Earlier, there had been crickets chirping, and all sorts of fresh night sounds, now there was nothing, just a deafening roar of silence.. No noise from the low flying plane either.. The plane could not have been one mile away from us, approaching, but it was taking it forever to get to us. Agonizingly slow, so slow it appeared to be standing still, which might have been the case! When it finally reached the two oak trees, it flew between them, but not past them, and began to ascend, slowly, straight up through the lowest branches, and low and behold, another set of lights, exactly the same, rose up right underneath the first pair! The spread of the planes' wing-span was the length of maybe a commercial tour plane, or a crop duster, it was not that big, about as wide as 5 average cars parked head to tail lengthwise. Strange thing, these planes were still moving forward painfully SLOW...and flying just over the top of the grass...skimming it actually. When both planes reached the oak tree branches, the upper most one veered right, seemingly to purposely give the bottom set of lights room to move up. We then knew we would now get a better view of these two slow planes as they rose as high as the top leaves of the oak trees they passed, and they were STILL approaching us. My brother wanted to shine our blindingly bright camper spotlight on them...but I warned him not to...very unsure why, but I told myself, he might blind the pilots, but these planes were doing things no piloted earth planes could do, and maybe the light they might shine back at us might not be so good. We thought this because they rose straight up in the air, and hovered there for minutes at a time, then they seemed to play with each other, turning, backing up, gyrating back and forth, like boats rocking on deep water, and flitting about, just like a humming bird can do. They seemed aware of each other's slightest movement, like they were alive? Plane #1 was now just above the two trees in the field, #2 was just above the grass, in plain view, but darkly shadowed by the trees' dense branches. They were both still facing us by the position of the landing lights, when plane #1 suddenly descended so quickly and violently atop #2, we knew they would crash together.... and crash they did, and there was absolutely NO NOISE. We saw them hit, wobble as if stunned, and just bounce off each other, continuing slowly, both ascending through the tree's thick heavy branches. The branches bent, and gave way around them, but didn't break. There was NO NOISE of leaves rustling, as this happened, and we were close enough to have heard that. By now they were just over the treetop's leaves, moving into the brilliant full moonlight, as they silhouetted against the moon, just above the telephone pole on the one dirt hill, now, on our right hand side, we began screaming. The planes were not planes! They had no wings, no sound, and they were completely circular...Like two gigantus pie pans put together! To this day I believe they heard us scream, because up until then, they seemed only interested in each other, and totally unaware of our presence. They hovered mid-air, after the screams, then began to descend slowly, right on top of us! They were just about 50 ft. above us, and they gave an appearance of being as light as the air itself by how gently they floated down. They were huge solid metal objects reflecting in the moonlight, but they floated, and gyrated about like weightless spinning leaves in the warm windless night, and they were still descending. They were close enough for me to hit them, if I threw a rock, and I can't throw worth a dime! They were bigger than our camper and they were going to land right on top of us! The saucer shaped circles were nickel colored, dull smooth steel on top with a raised flat darker top, and underneath an equally protruding flat black circular portioned bottom. No windows, seams, or doors were apparent. The colored landing lights, which had no rays, shone bright head on, but dully, when view from underneath! They were low enough now to block out the moonlight, and they were 3x the size of our camper which was the largest vehicle, holding a family of seven! OH! They WERE going to land on top of us!!! Suddenly, in the den of our commotion, as if becoming aware of our terror, they stopped descending, just stopped in mid-air, whirling like fitted stationary gyroscopes. Flying side by side, the two saucers went up on their sides together, from a horizontal to a vertical position, in perfect synchronization, and now stood in the sky, a stones' throw above us, like two huge pewter silver wheels. Suddenly an intensely bright light like a 4th of July sparkler started pushing out the middle of their dark bottom protrusions, while the same thing was happening simultaneously on the top protrusion, and all this met together around the rims length wise in a cohesive whole. They literally transformed from dull flat saucers into huge glowing orbs, right in front of, or right over our heads, about 25 ft. up, or closer, since I could hit them with a rock if I had had the nerve to throw one! no sparks dropped, or heat or noise was apparent. no smell of smoke or exhausts. This took only a matter of seconds to happen, and the minute the transformation was complete, both balls of light shot off like white hot meteors, in the direction of the Yuma city skyline... It took less than a minute for them to reach the city, where they hovered up and down just above it, looking for all the world like bouncing stars, glittering blue, then white, then red then green. They flew all along the top of the city, then they started back toward us! Food, supplies, and people flew everywhere. Getting in our perspective vehicles, and gunning the motors, we went from 0 to 90 in six minutes flat, raising a cloud of dust so thick we could barely see through it! Looking out our windows, and up, we could see the objects were back, and following us from the sky. They were now as high as any commercial plane, and looked like two planes from up there, but they were still flying in sync, and turning on a dime up there! They had their row of landing lights back on, and they were saucers again, but this time the lights were flashing like a real plane would do. They followed us (chased?) to the edge of the cities' outskirts where we slowed down, feeling safe enough to park, and watch them veer off, and up, back in the general direction from which we had just come! So you see, I know UFOs can transform shapes, and saw how they did it... I got the distinct impression they were as curious about us, as we were as scared of them. They seemed playful, if a machine could have a personality, like one kitten would play with another. I think they thought our camper and cars were worth looking at. until we popped out of them....like fleas or a virus, I suppose! Just an impression I got! Indulge me! We saw many, many more types after that, a few up very close, but not quite as personal! I continue to watch the skies. 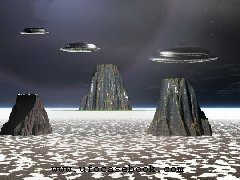 I am 52 years old now, and I have had enough UFO experiences to last a lifetime. I believe they still frequent Arizona, and various parts of Mexico, they got us there too! I have seen them actually disappear right while I was watching, so I know they can do that as well. I have to add, I thought they only frequent the rural areas, I was wrong, a couple of good city experiences took care of that! I tell this story to whomever wants to hear it. It never gets dull for me...this was before video cameras, and for some reason I am glad no one thought to use one of our, then, antiquated cameras with a flashbulb. geesh! I will consider writing some more of my UFO experiences soon. I see there is more of an interest now than when I was coming up. I was 19 or 20 when this happened to my family while traveling across the USA from California, to Mississippi.